Well, it’s been here for a few years now, but as with other CBD products it’s gaining popularity in many circles. CBD is becoming one of the fastest growing trends in 2018. My 65-year-old mom uses CBD oils for crying out loud, and she has always been against anything related to cannabis, even the ganja shirts I wore in high school got tossed out. It says something about the widespread conversation of a product when many of the people that are adopting it for its medicinal value or from a generation that demonized the cannabis plant. Well, it’s a new day and CBD infused products aren’t going away! I’m excited about all the potential that exists for CBD infused consumables, but one that really has wet my whistle is the idea of CBD infused beer. These beers are currently being made in many states from Portland to Vermont. 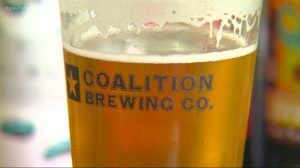 The CBD beer being made in Vermont has received a lot of attention and has been recognized as a pioneer in the CBD beer business. With CBD being legal in most states, it makes it easier for brewmasters to produce and sell these bottles of joy without worrying about local law enforcement acting a fool. Pure CBD oil extracts are most commonly sourced from industrial hemp and have medicinal value. CBD does not get you high. Imagine having natural medicine in your beer, all the more reason for me to sip a sixer! Normally I’m not a fan of infusing the beer with anything other than what it’s brewed with. Sure, hints of fruits and spices are nice with complex flavor profiles, but I’m talking about post-brew infusions. This is a different story though, and think that these two were destined to be blended together. Pure CBD oil is extracted from hemp, and hemp shares similar genetics with hops which are used to brew my favorite nectars. These were naturally meant to be together, they both have health benefits, great aromatics, and a mouth full of flavor. So why aren’t more breweries jumping on the CBD bandwagon? 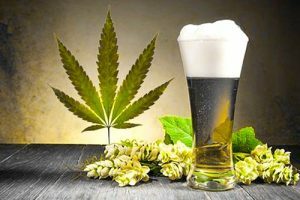 I’m not sure, but I do know that there are plenty of them that have taken the initiative and begun to brew batches of CBD infused beers. I’m ready for the ultimate CBD infused IPA! I’m talking 9.2% ABV with a huge dose of CBD. That would be the nightcap to end all nightcaps! It won’t be long before CBD beers will be found on tap at most of your local watering holes. I anticipate that the bigger tap houses in your area will be first to adopt it and smaller bars will follow as the CBD beers gain popularity among consumers. I am ready for the revolution, I take a heaping dose of CBD every day for joint pain, and inflammation. Having it infused with my beer would be like Christmas when I was 5. You should try and get your hands on some before the Feds shut CBD beer down. Currently, I have limited access to CBD beer where I live but am ordering some online this week. I’ll circle back on this post in a few weeks with a review of the CBD beer I buy. Until then, if you are interested, you can also buy CBD edibles online.